It might not be something you want to consider, but sometimes a player or his/her parents are so problematic for the team that the only option is to ask them to leave. When it comes to asking a player to leave the team, it’s best to consistently maintain a polite, professional manner in communicating the team’s intentions. 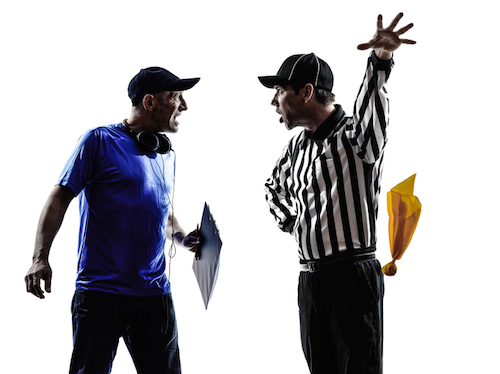 While it’s good to be firm in your message, at the same time, you should try to soften the blow of getting “kicked off” the team, which can be very tough to handle for the player, the parents and the team alike. He or she constantly exhibits a bad attitude and poor sportsmanship. He or she does not show up to games and practices. He or she pick fights or is abusive to teammates or other players. His or her parents like to fight or harass other parents or referees. Whatever the case may be, it should be the consensus of the coaches and league administrators that this player’s presence on the roster is detrimental to the team. This must be a joint decision, as no single individual—not even the coach—has the authority to remove a player based on a personal gripe. On the micro scale, say, two or three players at odds with one another, these issues are to be treated as small disputes, and it’s the responsibility of the coach to see them resolved. When it becomes evident that the powers that be are in agreement on removing a player (or several) from the roster, it is to be done swiftly and without wavering, in a fair and efficient manner. Consensus should be established through a vote or survey of the team managers. With email, social media and team management software playing such a big role in team management these days, coaches can conduct this process fairly anonymously by collecting opinions through one-on-one email or private messages. This takes some of the strain and awkwardness out of the situation. Seemingly every gathering of people of any size and cause will, at some point, develop a political web within (or from without), often creating pressures and unspoken rules. Youth sports, unfortunately, are not exempt from politics. Ostensibly minor actions and words have the potential to be very impactful down the line. Case in point: if the player-to-go has an allegiance with another player on the team—or, for that matter, if the parents of one player are friends with the parents of another—the loyal friend could also end up voluntarily leaving the team as a result of his friend’s dismissal. Therefore, it is important to bear in mind what the possible impact of these major decisions might have on the team. If dismissing a player comes at the cost of also losing a leading player, you need to strongly consider the repercussions and have a plan for moving forward. Doing just a bit of damage control can help smooth out this difficult process. Following up with both the player and parents in question, as well as the team, in the days or weeks following the action will have everyone feeling a bit more at ease about what just went down. Depending on the severity of the infractions, it helps to remind the player/parents that it’s not a personal decision, but rather one for the betterment of the team. It would also help to remind the team that they are “safe” and that this decision was voted on and served the majority’s decision. The best way to initiate a smooth dismissal is to be smart. Youth sports, as we all know, sometimes involves flaring tempers and high emotions. Being honest, diplomatic and careful in your dealings will maintain healthy team chemistry and, most importantly, keep the game fun. How would you deal with a problem player on your team? Let us know! Evan Tabachnick is Assistant Operations Manager at a local athletic facility. Warren Tabachnick is editor & publisher of CrossIceHockey.com. They both play in two recreational hockey leagues. Published by permission of CrossIceHockey.com—Where Rec Hockey Lives. © 2015 Digital Media Publications, Inc. All rights reserved.